Radiotherapy is the use of X-rays and other ionising radiations to treat patients who have been diagnosed with cancer. The therapeutic radiographer is someone who can combine technical skills with a caring attitude, has a sense of responsibility and enjoys working in a team. This course ensures students have the ability to undertake the accurate planning and delivery of treatment, the provision of a high standard of patient care, good inter-personal skills and the ability to adapt and respond to the individual needs of the patient. The BSc (Hons) Radiotherapy and Oncology embeds the Standards of Proficiency determined by the regulator, the Health and Care Professions Council (www.hcpc-uk.org). Graduates are eligible to apply for HCPC registration which is a requirement for employment in a broad range of NHS and private radiotherapy roles. The Department of Health Sciences is committed to embedding the NHS Values into everything we do; they define the behaviours and expectations of all our staff and students underpinning the work we do in the university and in the practice setting. University of Suffolk 360 - School of Health Sciences from University of Suffolk on Vimeo. Further information about the University's relationship with the Health and Care Professions Council (HCPC) and the Society and College of Radiographers (SCoR) is available in the PSRB register. As qualified therapeutic radiographers, graduates of the BSc (Hons) Radiotherapy and Oncology will be working in a rapidly evolving and complex area of healthcare. The course is designed to develop competent practitioners, capable of independent enquiry to support the provision of high quality, evidence-based care for patients undergoing radiotherapy. During the course students also have the opportunity to produce a professional development portfolio as part of Graduate Headstart which help to develop and evidence a wide range of transferable skills, enhancing employability. Students will be introduced to the principles of oncology, radiotherapy technique and patient care through engagement with material relating to some of the cancers most commonly treated with radiotherapy. In addition, students will be introduced to the anatomy and physiology associated with the musculo-skeletal system, cardiovascular system and sites of malignancies covered in this module. This module will provide the student with a sound knowledge base of health care principles,. which will enable students to recognise safe and unsafe practices and react or adapt to practical clinical situations appropriately. The module introduces students to the joint responsibilities of the inter-professional health care team and will be delivered to the joint diagnostic and therapeutic radiography cohort. This module will introduce the students to the technologies available for cancer treatment using radiotherapy. It will also introduce fundamental physical principles and relate them directly to the equipment and technologies being employed. In this way the fundamental principles will be taught in light of the equipment being considered and hence will be of greater relevance, value and interest. This module will introduce the principles of interprofessional working, contextualising each student’s growing professional identity within the broader interprofessional arena. There will be recognition of the individuality and commonalities within and between professionals, with subsequent analysis of effective interpersonal communication skills at a personal, professional and service user level. This is the first clinical practice module, providing an introductory experience for students and an opportunity to apply foundational theoretical knowledge gained on campus to practice. The primary focus of this module is on the core elements of the radiotherapy pathway: localisation in CT, megavoltage and superficial treatment with a short placement in an allied area e.g. clinic. Students will be required to demonstrate competence related to the core areas of practice, commensurate with level 4 and mapped to the HCPC standards of proficiency. This clinical practice module will provide an opportunity for students to build upon their experiences from Radiotherapy Practice 1 and continue to apply theoretical knowledge to practice. Students will be required to demonstrate competence related to the core areas of practice, commensurate with level 4 and mapped to the HCPC standards of proficiency. This module introduces five new body systems and explores the various malignancies that can occur within these systems. Themes from the level 4 oncology, anatomy and radiotherapy one module will be continued. The module is designed to introduce the anatomy, oncology and management of the male and female reproductive systems, the digestive system, the urinary system and integumentary system (anatomy component taught in OAR1). The purpose of this module is to facilitate the development of a detailed understanding of the principles of radiotherapy localisation, planning and verification in addition to supporting the development of skills of plan production and evaluation. This will build upon the foundational knowledge of radiotherapy physics and equipment gained at level 4 and will provide essential preparation for practice placements. This module will develop in the students a critical awareness of the diversity and relevant strengths of different research tools and approaches used healthcare. The module will draw on published research, its analysis and interpretation, enabling students to critically examine the various research methods used in professional practice. This module will build on the anatomical and oncological knowledge introduced during OAR1 and OAR2 and provide the students with the opportunity to expand their knowledge of radiotherapy techniques and clinical decision making. This module will conclude the oncology, anatomy and radiotherapy technique content for the programme, by enabling students to develop a detailed understanding of the remaining body systems and associated oncology. This clinical practice module will provide an opportunity for students to build upon their experiences from Radiotherapy Practice 1 and 2 and to draw on theoretical knowledge and sources of evidence to develop a growing level of independence in practice. The primary focus will be on the core elements of the radiotherapy pathway: localisation in CT, megavoltage and superficial treatment with short placements in the allied areas of diagnostic imaging and radionuclide imaging. This clinical practice module will provide an opportunity for students to build upon their earlier experiences in practice and to draw on theoretical knowledge and sources of evidence to develop a growing level of independence in practice. The focus of this module is on the pre-treatment part of the radiotherapy pathway (CT and dosimetry), whilst maintaining progress in megavoltage treatment. A short placement in an allied area of practice e.g. clinic, will complement the practice experience. The purpose is to provide students with a meaningful experience of conducting collaborative research, whilst enabling individuals to develop the skills and confidence to become research-active practitioners following graduation. This approach has been guided by the Society and College of Radiographers’ research strategy 2016-21. Small groups of students will be supported as partners in learning alongside an academic and a practice partner to design and conduct a small scale study. This module will introduce cancer survivorship and explore the physical, psychological and social factors that impact on survivorship for the individual, their friends and relatives. It will allow the student to critically reflect on the impact of treatment on the health and wellbeing of those affected by cancer and evaluates the need for support for people affected by cancer. This module is designed to prepare students from a variety of professional backgrounds to work within practice in health and social care organisations. The module promotes multi-agency working across health and social care teams. Management of self is key to evaluating their role and the role of others within the interprofessional team. A problem based approach will be used to develop managerial, leadership and advocacy skills in order to become an effective practitioner. Students will be encouraged to explore the issue of corporate responsibility. This clinical practice module will provide an opportunity for students to build upon their earlier experiences in practice and to draw on theoretical knowledge and sources of evidence to develop problem-solving abilities in practice. Practice placements will be scheduled between Radiotherapy Practice 5 and 6 to allow students to gain a full range of competence in CT, megavoltage and superficial treatments, plus short placements in brachytherapy and palliative care. This final clinical practice module will provide an opportunity for students to continue to develop problem-solving abilities in practice and to develop the confidence to take up their first posts after completionStudents will be required to demonstrate competence commensurate with level 6 and mapped to the HCPC standards of proficiency. 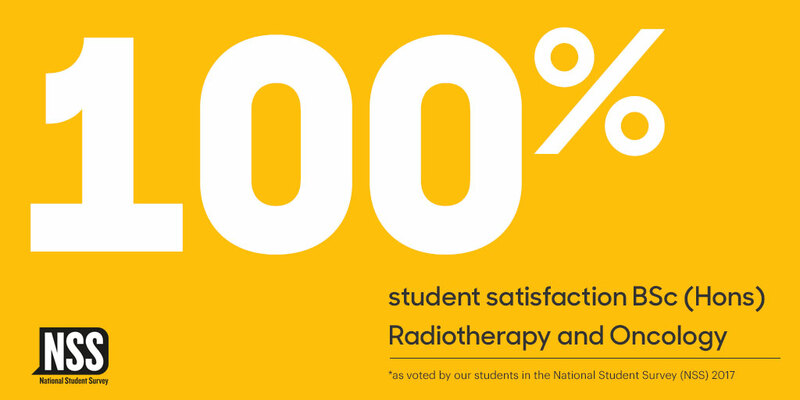 Attendance in practice will be monitored across Radiotherapy Practice 5 and 6 to ensure that students attain 90% at the point of completion of the programme. These include treatment preparation and delivery, posts in research, education, advanced practice and management. Students readily gain employment in both NHS Trusts and the private sector as qualified Therapeutic Radiographers. Following a period of additional study, many go on to specialise in a particular aspect of patient care, advanced practice, management, education or research. 112 UCAS tariff points (or above), BBC (A-Level), DMM (BTEC) or Access to Higher Education Diploma - a minimum of 45 Level 3 credits at merit grade or above. Applicants are expected to hold five GCSEs grade 4/C or above to include Mathematics, English and Science. Please note, equivalent Level 2 qualifications will not be accepted. Applicants whose first language is not English, but who have been living in the UK for 2 years or more will be expected to hold GCSE English at Grade C or above (grade 4-9 for the new GCSE), or the relevant Level 2 equivalent if accepted. The process of selection will include Multiple Mini Interviews (MMIs). As part of the selection process, you will be expected to demonstrate a good knowledge and a clear understanding of the scope of work that is required to be undertaken as well as the significance of the NHS Constitution and values. For applicants whose first language is not English, but who have been living in the UK for less than 2 years (or have not lived in the UK at all), we will accept IELTS or the University of Suffolk Password test as meeting the GCSE English requirement. Our students can benefit from extensive use of the state-of-the-art simulation suite on campus. This includes the Virtual Environment for Radiotherapy Training (VERT), Varian Eclipse treatment planning system and Radiotherapy Practical Room to give students a range of practical clinical skills. Approximately 60% of the course is spent on practice placements at one of four NHS Trusts in East Anglia, where students apply their developing theoretical knowledge and develop a full range of skills and competence needed to practice as therapeutic radiographers once registered with the HCPC.